With lights dimmed low and the pitter-patter sooth of rain falling outside, "No Sleeep" has Jackson as our guide to a sensual healing as she takes us for a tour around the interior of an gorgeous condo, titillating with each step and room as she tosses around a great head of hair and a lot of throwback feels to the atmospheric lounge vibes of "That's The Way Love Goes" and "I Get Lonely", while not looking a slice over 30. Her love is about to come all the way down when guest star J. Cole eases into the twenty foreplay, spinning a nicely woven-in flow ("I love diving in your mind and coming out with every diamond I could find...") that complements the chilled groove. Even though for the most part I haven't been moved by a hip-hop cameo in years, after ruminating with the official album track drop yesterday, I can concur that J. Cole is a nice fit to the track and his addition could stop all those silly qualms that "No Sleeep" doesn't 'fit' with today's music scene. Largely, this visual is just a feast for the eyes as I'm practically salivating over how stunning Janet looks (that HAIR! that STACK OF BRACELETS! that HAT!) and how I want Janet to adopt me and whisk me away so I live in that condo right now this second (that KITCHEN! that LIVING ROOM! that STAIRCASE!). It's also a calming balm to the soul, as we now have a brand new Jackson visual to put in the cache. Though I was hoping for a little more body movements (Janet really knows how egg on a tease, doesn't she? 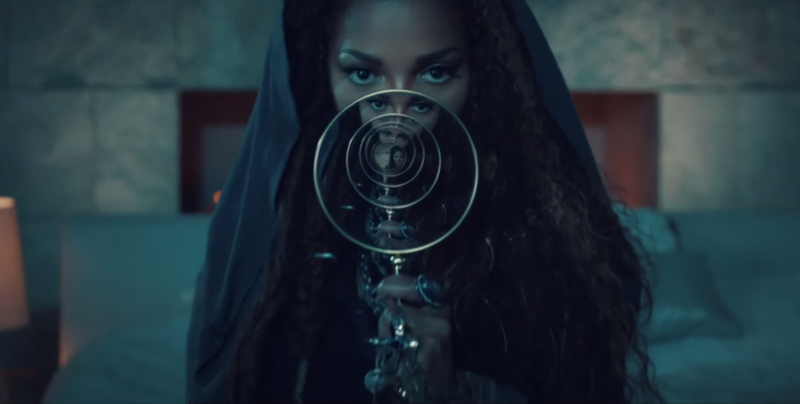 ), still I'll take simple yet effective thematic mediation and recalls of '90s era over nothing, as this visual is another great edition to the new movement that Janet is gliding oh so grandly into.